The novel began well enough with a lone Space Wolf in his death-throes as he fails on a mission given to him and there’s a lot of mystery tied to his death. It also sets the tone for the rest of the novel, in that it is quite dreary and doesn’t really move into anything really exciting. Unfortunately, the opening chapter is the most exciting chapter of the novel because that’s the one where you go in completely cold, expecting to be wowed and Chris Wraight delivers on that. He just fails to follow through on that promise. The novel itself is about Jarnhamar pack, a squad of Space Wolves in Ragnar’s Great Company who have recently suffered some losses and are in need of new blood. 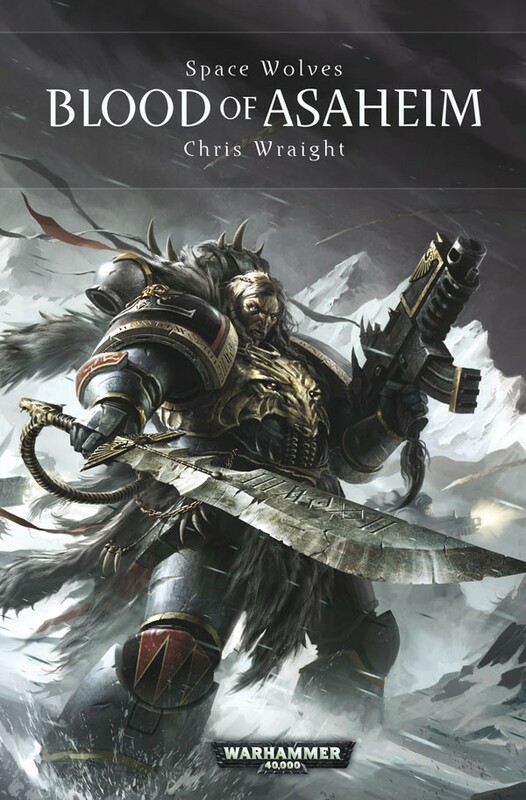 They have returned to Fenris and they are joined by one of their number who left more than half a century ago to join the alien-hunting arm of the Inquisition, the Ordo Xenos and its attendant Space Marine Chapter, the Deathwatch. The return of the Space Wolf Ingvar Orm Eversson, also known as the Gyrfalkon, is met with some subtle hostility by his former Pack brothers, given that he abandoned them when their need was greatest and now he has returned as a changed person. There’s a really, really good scene involving him and Ragnar, who must decide his fate as the Lord of the Great Company, and I loved that Ragnar was back. Wraight’s portrayal is very different from that of King, since the latter mostly showed the character as a hot-headed young Space Wolf, a Blood Claw, and had him grow over time, whereas Wraight shows him as a leader of his Chapter, one of its greatest heroes. But sadly, Ragnar is relegated to a cameo and we don’t see him again. Now, the entire character drama that results from Gyrfalkon rejoining Jarnhamar pack in and of itself is a good premise, but the execution is nothing new. Every beat that the author hits is something that is predictable and expected. There’s no deviation from the norm. And that’s the greatest failing of the novel. The characters are all locked into cliches and they never grow out of it. They start out well, but they develop into being bland and boring by the end. This wasn’t the toughest BL novel I’ve read to date, but it was a bit of slow going nonetheless since I constantly wanted to put down the book and read something else. Another thing that got to me that Wraight’s Space Wolves are actually reluctant and ashamed to call themselves Space Wolves. When Dan Abnett reimagined the Chapter as a Legion during the Horus Heresy, he gave them a new name, the Rout, with the term Space Wolf being reserved as something that others called them, partly out of some amusement. Wraight takes that yet further and he has at least two moments in the novel where the character cringe when they are called Space Wolves. I’m all for creative reimagining, but this? This rankled with me. Its as if the Ultramarines are ashamed of being called such and they prefer “Battle Kings of Konor”. Or the Blood Angels are ashamed of their name and they call themselves “Angels of Baal” or something, I don’t know. Its a really, really weird thing to do. Chris Wraight’s portrayal of Chaos is actually quite good in the novel, especially with the villains, but my issue with it was that we don’t really get much of a sense of what’s happening. Its as if there are plots within plots and lots of red herrings on the dinner table. It was confusing and it was, unfortunately, a bit of a mess. The writing fluctuated between good prose and bad prose often, especially with regards to the dialogue. Now, I say with pride that I love Bill King’s old novels, despite the fact that some of the things in it are outdated, but the dialogue was often very cliche and boring. It was too much grandstanding, and some of the Jarnhamar pack behave like idiots, when they actually do know better. All in the name of pride. And finally, the book introduces too many secrets and it never gives a closure on any of them, in my understanding. Its as if Chris Wraight is setting the stage for a trilogy or some such but given that there is a distinct lack of anything such from the publisher, this all fails in the end. It just doesn’t hold up. I liked some of the Pack rituals that Wraight introduced, as well as the portrayal of the Sisters of Battle characters, but little else beyond that. This wasn’t the novel I expected, and after Wrath of Iron, I’m somewhat disillusioned with Wraight’s writing since this is his second novel in a row that I have not liked. Posted on December 6, 2013, in 2013 Reading Challenge, Book Reviews, Challenges, Review Central and tagged 2013 Reading Challenge, Black Library, Blood of Asaheim, Book Review, Chaos, Chaos Space Marines, Chris Wraight, Nurgle, Review, Review Central, Science Fiction, Space Marines, Space Opera, Space Wolves, Tie-in fiction, Warhammer 40k. Bookmark the permalink. 7 Comments. You didn’t like ‘Wrath of Iron’?!?!? How can you *not* like ‘Wrath of Iron’?!?!? I found Wrath of Iron to be extremely bland.